Odense Stadion known as TREFOR Park for sponsorship reasons is a purpose built football stadium located in the city of Odense which is the third largest in Denmark. Dating back as early as 1941, the ground was renovated in 1997 which resulted in the stadiums current capacity of 15,633. 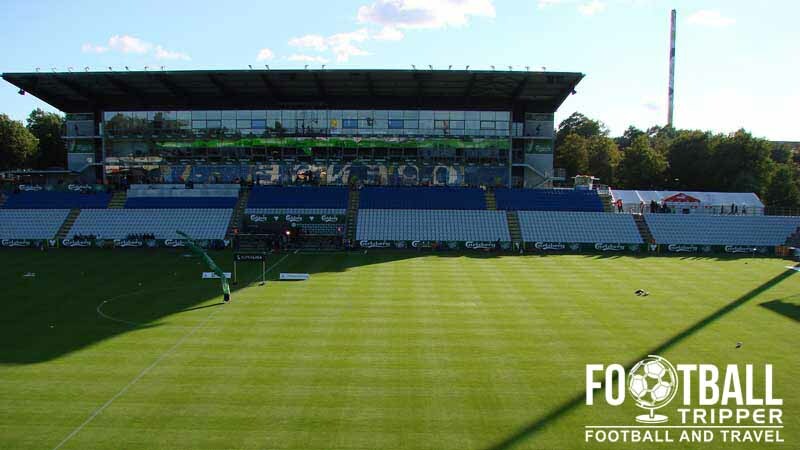 Odense FC have been playing football at the site of today’s stadium since at least 1941, and in the 1990s Odense City Council in collaboration with the club decided to modernise the facilities. In 1997 the main grandstand and the two goal-ends were rebuilt which kick-started the project of rejuvenation, and later between 2004-2005 the remaining grandstand was rebuilt. In June 2005 in order to generate additional income and to help offset some of the costs of redeveloping the stadium the club began to sell the naming rights of the ground. Fiona Bank initially purchased the naming rights on a 9 year deal but after going bankrupt, the rights were then resold to energy company TRE-FOR in 2010. TRE-FOR Park is currently the fifth largest ground stadium in Denmark, but is often placed in the same bracket as Brøndby Stadion and Parken as it satisfies UEFA’s stadium criteria and is fit to host matches of the Champions League. 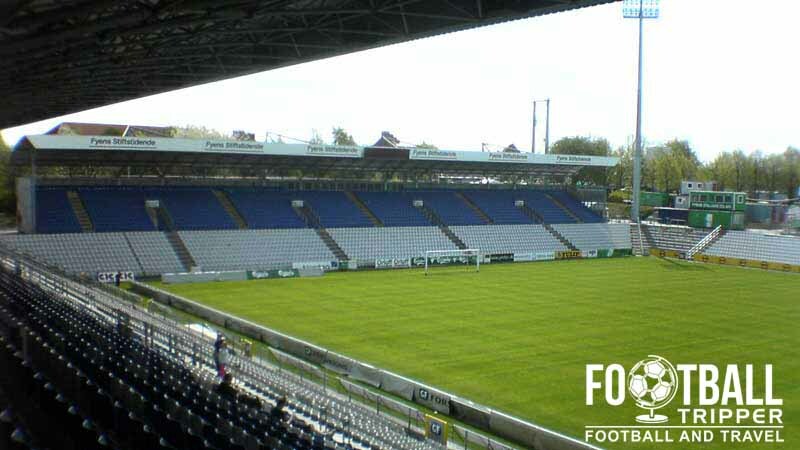 Since the large scale remodelling, the record attendance was set on 11th May 2009 when 15,486 fans saw Odense defeat FC Copenhagen 3-2 in the race for Europe. 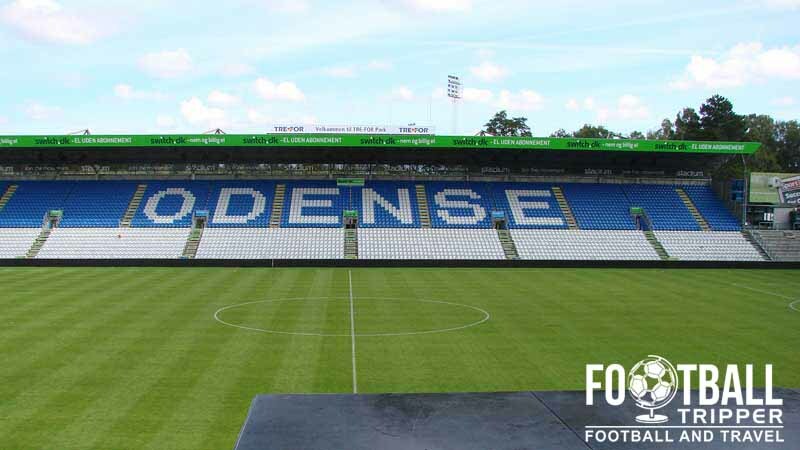 As for the foreseeable future, it doesn’t appear as if there are any other plans for expansion or renovation, with Odense Stadion leading the way in terms of Danish Stadiums. 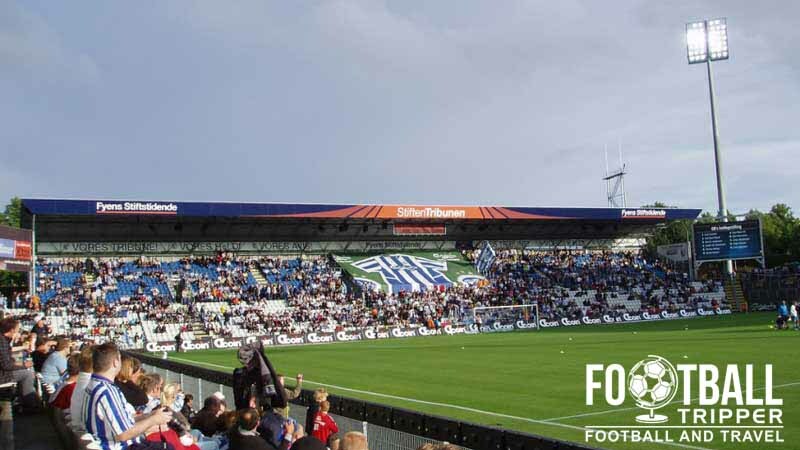 The Odense Ultras have vocally opposed large-scale conversion to seating behind the goals as they believe this negatively affects the atmosphere, so in the future a relaxation on terrace may be reintroduced to the ground. TRE-FOR Park is comprised of four stands: North, East, South and West. Away fans are housed within the north-east corner of the stadium within Section D1 as per the above seating plan. There is enough room to accommodate up to 800 visiting supporters per match. There is a Odense BK fan shop located at TRE-FOR-Park however it appears as if it only opens on matchdays. As a result you may wish to browse the range of official merchandise from the online store instead. It doesn’t appear as if either the municipality of Odense or the football club offer any guided tours of Tre For Park at this moment in time. Tickets to see Odense BK play at home can either be purchased online from the official website (print at home) or in person from the various ticket booths around the ground on matchdays which usually open three hours before kick-off. 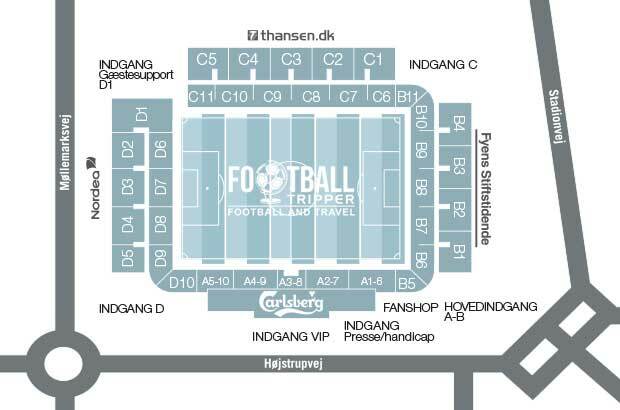 With the exception of the matches against FC Copenhagen and Brondby IF tickets usually cost 50.00 kr for a place on the terrace and then anywhere between 80.00 kr – 120.00 kr for a seat in either tribune along the side of the pitch. TREFOR Park is located within the district of Højstrup approximately 4.2 km west of Odense city centre just about within the outer limits of the ring road. The journey by foot will likely take the average Football Tripper the best part of 50 minutes and thus its recommended that you use public transport. Despite the out of town location, on-site parking at the Idratespark where TREFOR Park sits is limited on matchdays. Make sure that you travel there early in order to suss out the parking situation at he nearby car parks at the University College and Lidl. Odense Railway Station is located centrally within the city and unfortunately there aren’t any substations which you can use to get to the stadium on matchday. Sometimes known as Odense Banegård Center in Danish, Odense Railway Station sits on the Copenhagen–Fredericia/Taulov Line with frequent services to the capital. TREFOR Park is blessed with its own bus stop which is known as “Odense Idrætspark”. Less than a few hundred metres north-west of the ground, the bus stop is served by bus numbers: 11, 31, 31S, 32, 39S and 71. Odense Airport named after Hans Christian Andersen is located in the village of Beldringe a few kilometres north-west of the city centre, however it is generally only served by domestic flights. You won’t find any places to stay near Odense BK’s stadium as the city’s accommodation options are all found back towards the area south of the train station. Three well priced options which are a minimum of three stars are Hotel Dimir, Ydes Hotel and Radisson Blue which is next to the Carl Nielsen museum.